I’m the type of person that always needs to have flavor in my drinks. Which usually leads to drinking lots of soda and juice. While okay in moderation, what I really need to do is drink more water. I’m always up for trying new ways to get myself to drink more of it and was excited to find the Prodyne Fruit Infusion Pitcher. First off, what a genius idea! The Fruit Infusion Pitcher has a removable rod that you can fill with fruit to give your water a touch of flavor. Genius, right?! The moment my pitcher arrived I cleaned and sliced some strawberries and lemons and filled the rod. Next, you fill the pitcher with water, place the rod on the pitcher lid and your done. Then I just placed the pitcher in the fridge to chill and within an hour I took it out and poured my first glass. The water from my Fruit Infusion Pitcher was refreshing and had just the right amount of flavor from the fresh lemons and strawberry slices. Once you pour water out of the pitcher you can refill it with more water without having to replace the fruit for up to 7 days. I’m excited to try out more fruit combinations and you can use it to make fruit infused tea too! Since having my Prodyne Fruit Infusion Pitcher the whole family has been drinking more water which is great since we could all stand to drink more water! The Fruit Infusion Pitcher also makes for a lovely display and will be great for get togethers and parties! 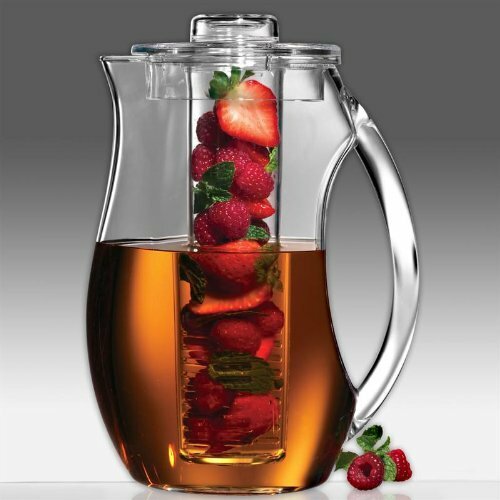 The Prodyne Fruit Infusion Pitcher can be purchased directly from Prodyne on www.amazon.com for $16.29 with FREE Super Saver Shipping! Prodyne is giving one lucky reader a Prodyne Fruit Infusion Pitcher for the A New Year, A New Me Giveaway Event! Be sure to visit Mommy Digger daily from January 24-31st to enter each day for your chance to win! I received a Prodyne Fruit Infusion Pitcher for the purpose of this honest review. All thoughts and opinions are my own. This post was written by me and not edited by anyone. I drink a lot of water, but it can get boring! What a great way to give it some flavor without a bunch of added sugar and preservatives! This would help me wean myself from fruit juices. This would be so great to use for my picky kids who don’t like pulp or floaties in their water! Love the concept!